1.1 The current government inherited an appalling debt and deficit caused in part by previous governments and in part by the Global Great Recession (which the previous governments of the UK, EU and US all played their part in causing, or rather, allowing banks they should have been regulating to cause). Cutting that deficit in half is an impressive feat, however, it could arguably have been done differently without simultaneously causing the “Cost of living crisis” and significantly widening the gap between rich and poor in the UK. Despite the horrific side affect, we should at least be relieved that the deficit is half what it was because otherwise our situation would be (even) worse. 1.2 There has been some fiscal and financial reform, but only the government would describe this as “far-reaching” or “structural”. Other financial and fiscal experts describe it instead as “tinkering around the edges” while protecting significant vested interests of The Establishment. If you have time to spare, the Sovereign Money backbench debate highlights are really interesting and educational for those just starting to realise that financial reform could literally change the world for the better (for the rich AND the 99%). sectors”. This is highly optimistic since most oberservers state that the apparent health of the UK economy is currently being artificially proped up by a housing market bubble – see the unsustainable sharpe increase in house pric es in some areas over the last 12 months, which is deepening the “cost of living crisis” and widening the gap between the rich and old and the young and poor. Not really something to be hugely proud of in my opinion. 1.4 GDP is gradually going up. Yey, except this is partly on the back of the aforementioned housing bubble and widening economic inequality, which is why most of us no longer associate these kind of figures with our own personal or family quality of life. There is also a lot of information on growth in various areas and warnings about the 40% probability of recession in the Eurozone and Japan having just entered recession. This impacts our exports and global markets generally which is useful and important but does not impact my household directly right now. 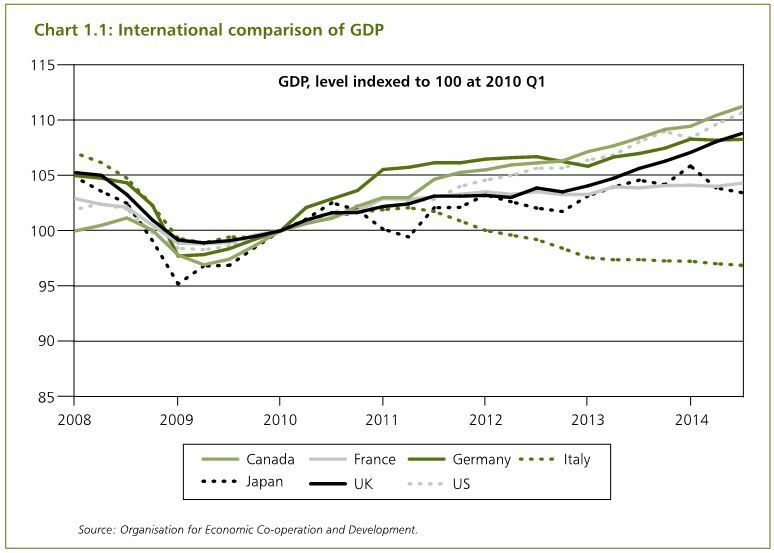 Equally I am skipping over things like the UK’s debt as a percentage of GDP due to time constraints. It is great that the Bank of Englad base rate is being kept at 0.5% and helps people who are in debt not to be worse off (this is independent of the government). I’m going to have to put my hands up and say that I am no expert on the NHS but I am not convinced that the announced “extra funding” for the NHS is going to the right places. It sounds a bit suspect, especially since this document rarely quotes how much was already due to be spent making it impossible to judge the before and after without spending hours pouring over previous budgets. You should never get away with this sort of reporting in engineering. Statements such as “has been increased from X to Y” would be much more helpful for us to view the bigger picture, without it I find it hard to trust that I’m not being mislead. NHS mandate will commit to parity of esteem between physical and mental health.” It is great that the importance of this acknowledged and that eating disorders are specifically highlighted, but especially in the depths of the “cost of living crisis” depression and anxiety are also huge problems overloading systems such as Talking Therapies in Reading (who are great, just not enough of them!). 1.10 Employer national insurance contributions up to the upper earnings limits have been abolished for apprentices under 25 years of age and all employees under 21. This sounds like it should help employers to take on apprentices (who presumably won’t be paying national insurance because they will not exceed the lower earnings limit, but in case they are receiving a living wage, it would be a good idea to simultaneously abolish the employee NI contributions to the same level). In the same section (and section 1.151) student loans are being introduced to encourage graduates pursue further study (thus removing themselves from the unemployed list and building additional personal debt). Along with the removal of the cap on undergraduate student numbers this year, this is a TERRIBLE idea as it will further increase the number of young people cripplingly indebted to the generation above. There is a section on infrastructure investment which I’ve also skipped over only to note that there is a lot about promoting fracking and shale gas development in direct contradiction to most of the electorates wishes. I am most definitely in the “No fracking” camp, despite being a chemical engineer – I’d much rather expend my engineering expertise on sustainable solutions like renewables and only spend a minimal effort to decarbonise existing technologies (via clean-up technologies like carbon capture and storage) until such a time as renewables-only can be sensibly employed. 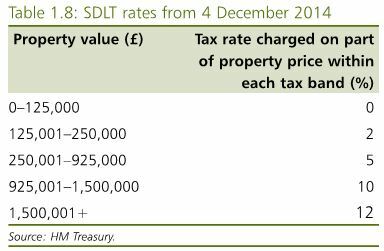 So the rate for households valued at £250,000 will be effectively the same (1% overall), but it will now be possible to purchase a little place in Reading and, just maybe, not pay any stamp duty at all, certainly a lot less. The personal allowance (bottom threshold) is going up more than inflation from £10,000 per year to £10,600 (6%), which is BRILLIANT, but the higher threshold (20% to 40%) is only going up by inflation (well, 1.2%,so slightly below inflation for last month, which was 1.3%). From this change alone I will be £19 a month better off. (Yes, I’m working in Dubai now, but I’ll be back for good at the change of the tax year… in 127 days) £19 is definately better than a poke in the eye, but it won’t notice compared to my £1800 a month childcare bills (2 children under 4, 5 days a week). Much is then made about tax relief for savers including: “those earning under £15,600 need pay no tax on any of their savings income”. While I welcome all help for anyone on a low wage, seriously, who has any savings these days that earn them any significant income? I have not had any savings since the day my son was born, so this has no impact on me. Does it affect many people I wonder, who were not already rich (my definition of “rich” these days is “has disposable income”)? The same will go for the transfer of tax-free ISA allowances to your partner when you die. Yet more benefits for the already rich at the general tax-payers expense. The “Fair and Affordable Welfare System”, including Universal Credit, can be found on page 57. I’m sorry but I am now out of time as I have to get back to the day job, before I start a rant about how the welfare system should never have the word “affordable” associated with it (exactly what is the value of a human life to the government such that “affordable” can be a judgement criteria? Apparently less if you cannot afford to support yourself through some misfortune or another which they are not interested in than if you are a pensioner with substantial personal savings). Sigh, what would have made a difference to my family being able to make ends meet with 2 children under school age would be tax relief of the order of my monthly expenditure on childcare. When you pay £1800 a month on childcare and £1400 in tax and national insurance, it is not surprising if there is nothing left to pay for food, heat and housing, this budget has made no difference to that immediate need. Imagine if I could have had some or all of that £1400 with which to pay the bills..? I might not have accumulated £30k debt in the first 3 years after my son was born. Thank heavens my son is nearly old enough for school and Dubai pays engineers a lot more than the UK does. But I continue to fear for those on lower income than mine with longer until their little ones are big enough for school, I really don’t know how they manage… and this budget certainly won’t have helped them. How about removing VAT from more of life’s essentials, like food and tampons?